Today, Lagos is an important piscatorial, commercial and tourist centre. Of all the Algarves towns perhaps none has so much to offer as the historic city of Lagos . When the Arabs from Morocco ruled the Algarve, Lagos was their capital city. Parts of the spectacular Lagos city walls date from those times. Later the massive square towers and the fort on the Lagos avenida were added to defend against Spain. It was from the port of Lagos that the ancient mariners set out to discover the coasts of Africa, America, South America and the route to Asia. It was not for glory or science that those men sailed small ships from Lagos to beyond the edge of the known world. Trade made Portugal and Lagos rich, and no trade richer than that in slaves. Today the ancient slave market at Lagos displays nothing more sinister than art and sculpture. A different kind of boat visits Lagos today. Lagos marina attracts cruising yachts on passage to and from the Mediterranean. Lagos is also a popular centre for golf with nearby Palmeiras golf course on Meia Praia. This historic town has played an important part in the story of Europe. It was the capital of the Algarve from 1576 until 1756 and there still stand many ancient buildings to testify to its historic glory. From its port maritime expeditions were embarked to discover the world at the orders of Prince Henry the Navigator. It was from this very harbour that Vasco da Gama sailed in 1499 on his historic discovery voyage. Essentially now an important tourist town there are still many architectural signs of its ancient past, even a building dating back to this period that is recorded as being Europe’s first slave-market. The walls of the town are in most parts remaining after areas of restoration. Attached to the famous 18th century "gold" church of Santo António there is a small museum of regional items, some of which are quite odd! There are several interesting statues erected to the famous past figures that are associated with the history of this town. A small shrine commemorates the Algarve’s only saint, São Gonçalo de Lagos who was born in 1360. The more recently constructed Marina presents a lovely picture. It is usually full of boats on their way to and from the Mediterranean. The municipal council has constructed a Cultural Centre in which various exhibitions and culturally related events are held during the year. In days gone by, the Bay of Lagos sheltered Phoenician, Greek and Carthaginian boats which came here for commercial trade. It was called Lacσbriga by the Romans, Zawai by the Arabs and became Lagos after being conquered by D. Afonso III. The historic patrimony is greatly represented in ecclesiastic buildings and sacred motifs, which are patent in the Santo Antσnio, São Sebastião, Misericσrdia and Carmo Churches. The Town walls were built in the 16th century and completely encircle the Town. Besides this, Lagos also offers the Slave Market, the 17th century Fort of Ponta da Bandeira which defended the entrance to the port, and the Lagos Municipal Museum, which holds an enviable archaeological and ethnographic collection as well as objects of sacred art and paintings. The city of Lagos has its roots in the pre-historical times. Not far from here we can found the presence of megalithic civilization. One of the megaliths found not very far from Lagos, in Odeáxere. It has been an important trade place for Phoenicians, Greeks and Punics. In roman times it was Lacobriga and in the 8th century with the Muslim conquest received the name of Zawaia. Lagos was conquered by the Christian King of Portugal Afonso III, in 1249. Portugal was a kingdom since 1143. During the period of the discoveries, in the 15th century, Lagos was an important naval base due to the action of Prince Henry, the Navigator, living here, who sent little caravels to explore the coast of Africa and, in return, brought gold, ivory and slaves. The statue of Prince Henry, the Navigator, facing the ocean, in the old sector of Lagos. In 1434, Gil Eanes, born in Lagos, reached the Bojador Cape, an important stage of the discoveries. The Gil Eanes statue, also facing the Atlantic. 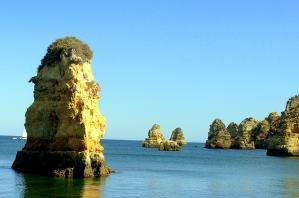 Lagos was capital of the Algarve province from 1576 to 1755, year of the most destructive earthquake of Portuguese history. The most significant part of its patrimony was destructed. A combination of rainfall and the sea has carved the rocks into arches and sea filled caves. Decline the offer of a boat trip from the small open boats on the Avenida . Many of the boats lack adequate safety equipment and rarely seem to give value for money. Along the headland to Ponte de Piedade there are several delightful bays where you can laze on sandy beaches and chill out at memorable beach bars. Best avoid the temptation to swim at the beaches next to the river mouth. The water is heavily polluted and has caused serious illness.